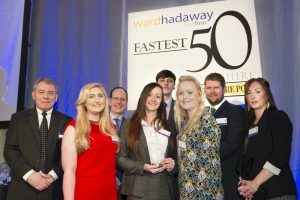 TRANSPORT smartcard specialist ESP Systex proved to be the prime mover amongst Yorkshire's privately owned companies with a double win at the Ward Hadaway Yorkshire Fastest 50 Awards 2016. The Hull-based company won the awards for Fastest Growing Large Business and Overall Fastest Growing Business at the event at Aspire Leeds. Prime mover – Terry Dunn, Chief Executive of ESP Systex Group, celebrates winning the fastest growing large business and fastest growing overall business at the Yorkshire Fastest 50 Awards 2016. ESP Systex, which is part of the ESP Systex Group, has grown to become a market leader in smartcard issuing, management and fulfilment for the transport sector with clients including Transport for London, the Association of Train Operating Companies, London Councils and the Scottish Government. The company’s stated aim is to use technology to help people’s lives become simpler rather than more complicated and help transport operators and cities to deliver the transport services of the future. Terry Dunn, Chief Executive, of ESP Systex Group, said: “We are so pleased to win and we really didn’t expect to. “I think the secret behind our growth has been taking chances and recruiting the right people. Transforming from small to medium to large has been a big challenge and it’s about people primarily and creating the right atmosphere for them to perform in. ESP Systex won the Fastest Growing Large Business after coming second in the same category in the 2015 Yorkshire Fastest 50 Awards. Second-placed in the Fastest Growing Large Business for 2016 was Leeds-based speciality textile oils supplier Vickers Oils whilst Harrogate-based multi-channel retailer High Street TV was third in the category. 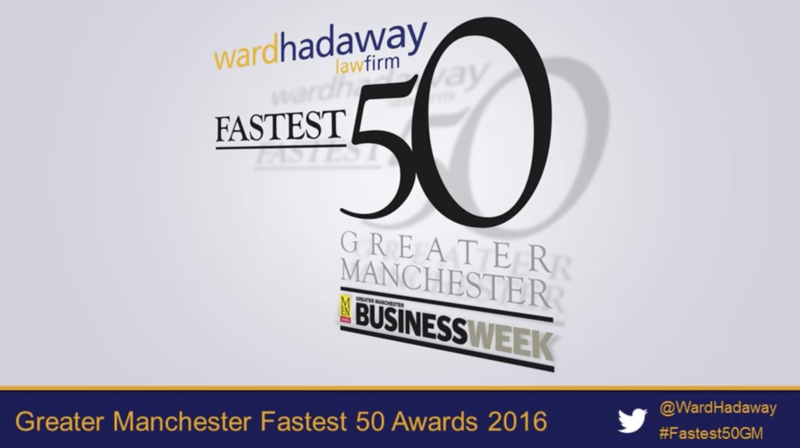 ESP Systex was not the only winner at the awards, organised by Top 100 UK law firm Ward Hadaway in association with The Yorkshire Post. Fastest growing small company winners Pet Brands (front, from second left) Rachel Barrass, Charlotte Parker, Ben Ledgerd, Chelsea Reeves and Donna Hoyle receive their trophy from (left) Philip Jordan of Ward Hadaway (third from left) John Cridland of Transport for the North and (second from right) James Mitchinson of The Yorkshire Post. Dewsbury-based Pet Brands was named the Fastest Growing Small Business in Yorkshire for 2016. The company designs and manufactures a wide range of accessories and treats for pets and wild birds, serving a UK and international customer base spread across more than 40 countries. Donna Hoyle, Operations Manager, at Pet Brands, said: “We are really pleased to win – it’s a brilliant achievement. Second place in the Fastest Growing Small Business category went to Sheffield-based electrical safety services provider Guardian Electrical Solutions Limited Wines while Dewsbury-based mattress and pillow maker AJ Foam Ltd took third place. Bradford-based Advanced Forwarding Limited performed the impressive feat of retaining its title of Fastest Growing Medium-Sized Business of the Year after winning the same award in 2015. Part of the Advanced Supply Chain group, Advanced Forwarding provides a range of logistics and international freight forwarding services. 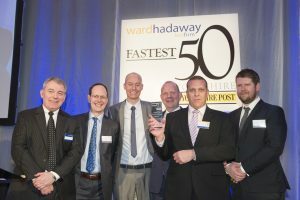 Advanced Forwarding receive the award for Fastest Growing Medium Sized Business – from left are Philip Jordan of Ward Hadaway; John Cridland of Transport for the North; Nick Kay, Ben Balfour and Rory Watts of Advanced Forwarding and Yorkshire Post editor James Mitchinson. Nick Kay, Director at Advanced Supply Chain, said: “We are so pleased for all of the team at the business who have put in so much hard work and skill – this award is really for them. Advanced Forwarding won the award ahead of soft and alcoholic drinks producer Corinthian Brands of Knaresborough, who were second, and third-placed Simon Gibson Transport, which is based in Goole and specialises in bulk power and granular product transport, handling and storage. The winning companies and the runners-up were revealed before an audience of more than 200 people, including Fastest 50 company representatives and Yorkshire business leaders, at Aspire in Leeds on Friday 20 March. Former CBI director general and current Transport for the North chair John Cridland gave the keynote speech at the event. Mr Cridland praised the Ward Hadaway Yorkshire Fastest 50 for focusing on businesses of all sizes and he outlined Transport for the North’s plans to boost transport and connectivity right across the North of England. The Yorkshire Post Editor James Mitchinson introduced the awards, which reward profit-making privately-owned companies and organisations in the region which have shown the strongest annualised sales growth over recent years. Ward Hadaway Commercial Partner Philip Jordan talked about the firm’s involvement in the awards, which were first held in Yorkshire in 2011, and about Ward Hadaway’s growth in Yorkshire. Researchers at Bradford University School of Management compiled the Yorkshire Fastest 50 list for 2016. 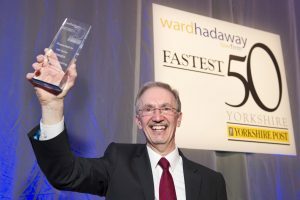 Jamie Martin, Managing Partner at event organiser Ward Hadaway, said: “This is the sixth time which we have held the Ward Hadaway Yorkshire Fastest 50 Awards and we never cease to be impressed by the brilliance of the businesses which the event highlights. “All of the winners and indeed every company in the Fastest 50 deserve praise and congratulations for their achievements in expanding their businesses at the same time as remaining profitable. “It is their hard work, determination and vision which is help to generate prosperity, create jobs and attract investment to the region. * To read a special 12-page supplement on the Ward Hadaway Yorkshire Fastest 50 Awards 2016, please click here.